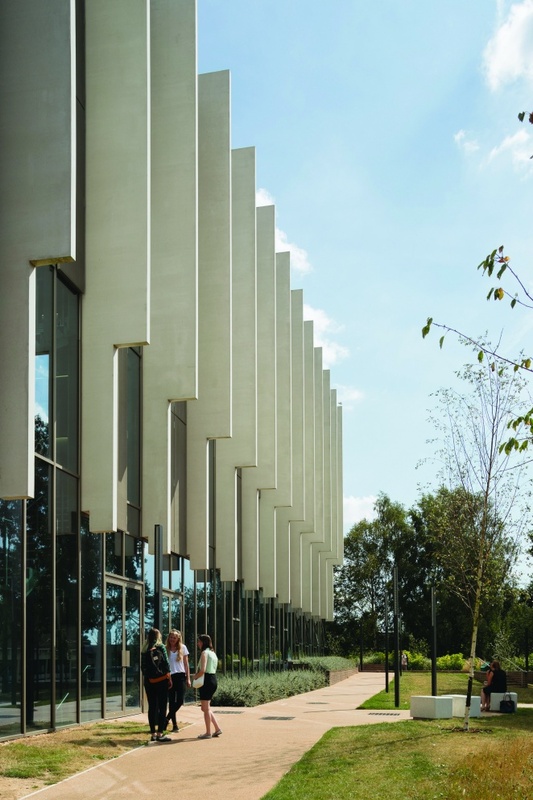 The design of a new extension to a university library in Kent both acts as a counterpoint to the pre-existing 1960s brutalist building, and achieves unification between old and new. Sébastien Reed reports. The original masterplan for the University of Kent, whose Templeman Library on the main Canterbury campus recently underwent a major extension, was drawn by Boer-born British architect Lord Holford in 1964. 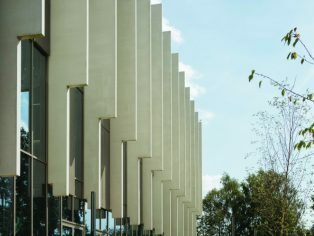 The design’s brutalist style, typical of the era, was forward-looking, but its limitations in the face of fast-growing student numbers led to it undergoing a variety of extensions. The first phase of the library’s construction, completed in 1965, delivered a building with an envelope constructed almost entirely of brick, with heavy brick piers and concrete extrusions at mid-level where the first floor meets the second. An extension to the east wing in 1975 joined the original central and west blocks, and in 1996 a small cubic brick block was plugged into the end of the east wing, which both aesthetically and in terms of performance left a lot to be desired. 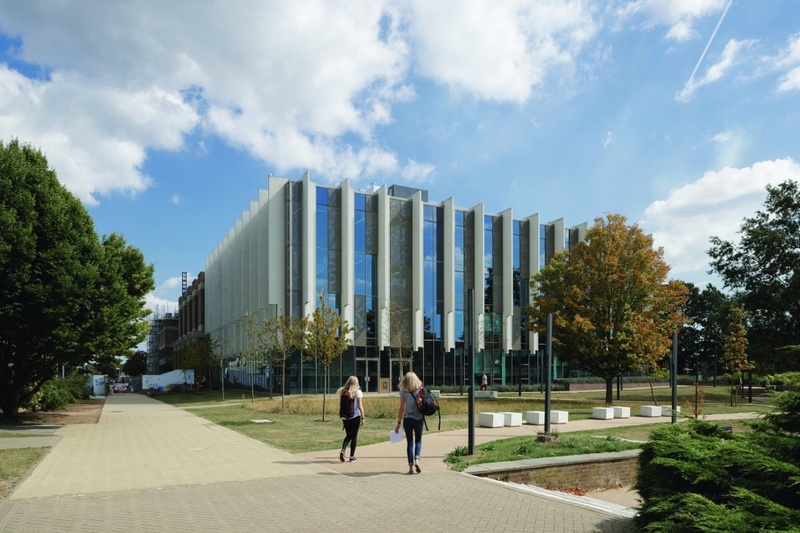 Twenty years on, and Templeman Library has received another, more holistic makeover. 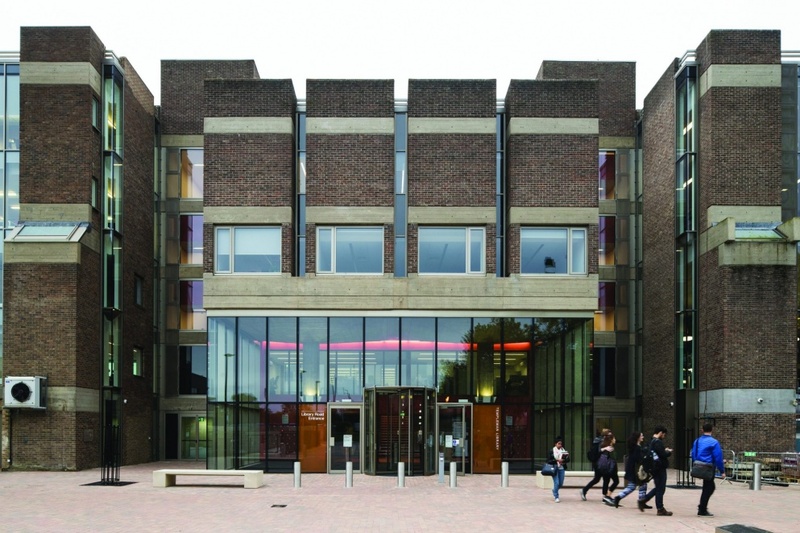 London-based Penoyre & Prasad were selected to develop the library space to better accommodate the current and future activity, which this kind of building needs to be effective. 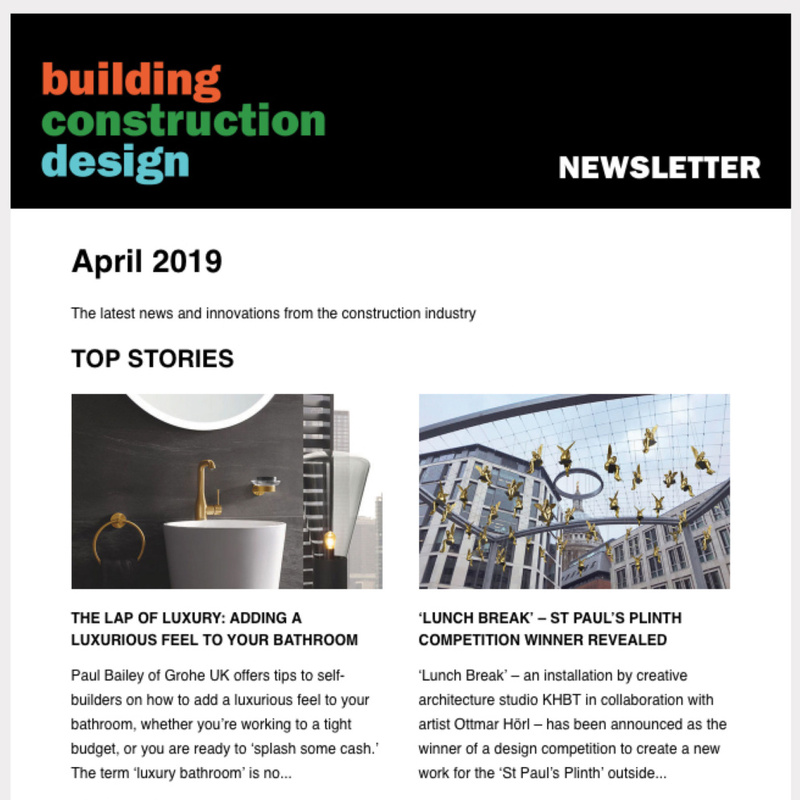 Suzi Winstanley, partner at Penoyre & Prasad and project leader of the extension and renovation, told ADF that there were challenges to overcome in not only creating a place not only well adapted to current needs, but also one that could be adapted over time. The University of Kent held a competition in 2012 to design the project. 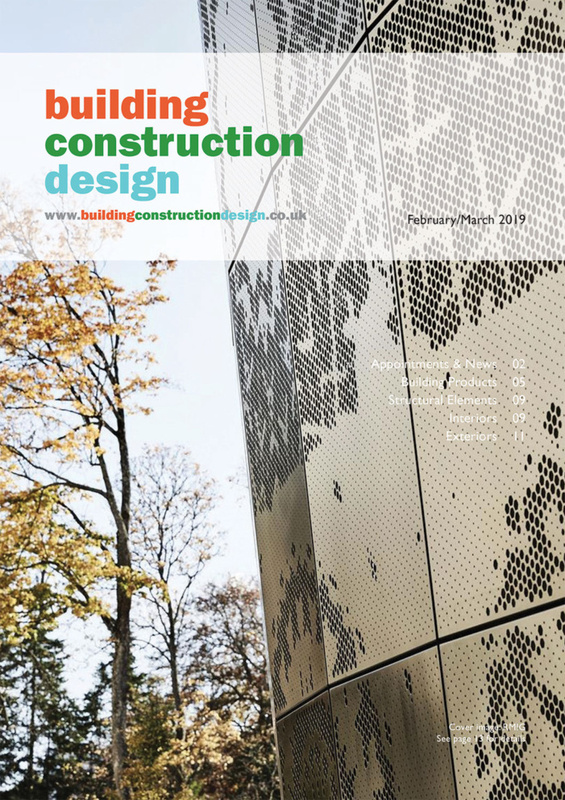 Winstanley comments on the benefits of competitions: “They allow the architect to come up with a concept that is strong, that sticks through the rest of the project”. There were a plethora of underlying issues associated with the building’s outdated pre-existing concrete construction. 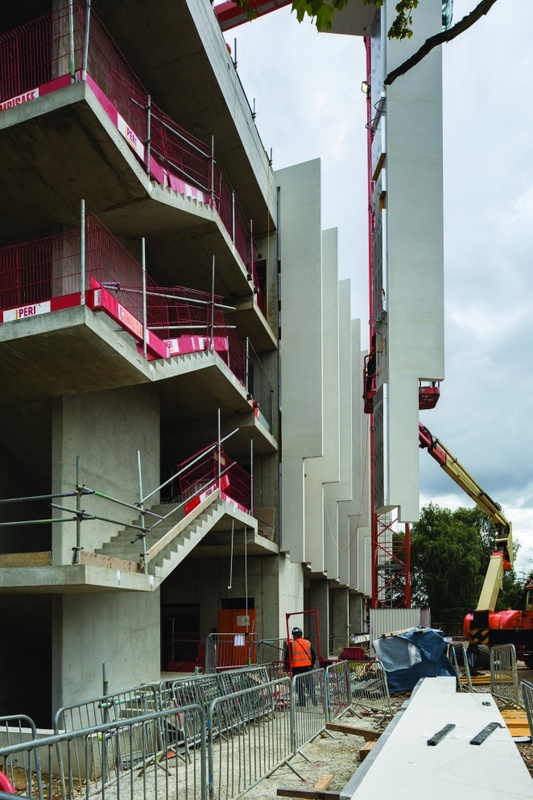 The cold-bridging of spalling concrete leading to damp had been aggravated further by poor ventilation, dark central spaces, narrow staircases, and a lack of level access, plus inadequate furnishings and furniture, were just some of the problems which the university was keen to solve. In terms of the site and location, the objective was “to pick up on the existing masterplan and create another new contemporary wing to the library,” says Winstanley. An important guiding principle for the architects was that the extension needed to be something that could be “woven into the old building,” so it was “respectful and sympathetic to the old, but also tried to lift and rejuvenate it.” She continues: “We wanted to create a counterpoint to the existing heaviness of the brutalist building.” There were two further practical focal points for Penoyre & Prasad’s response. 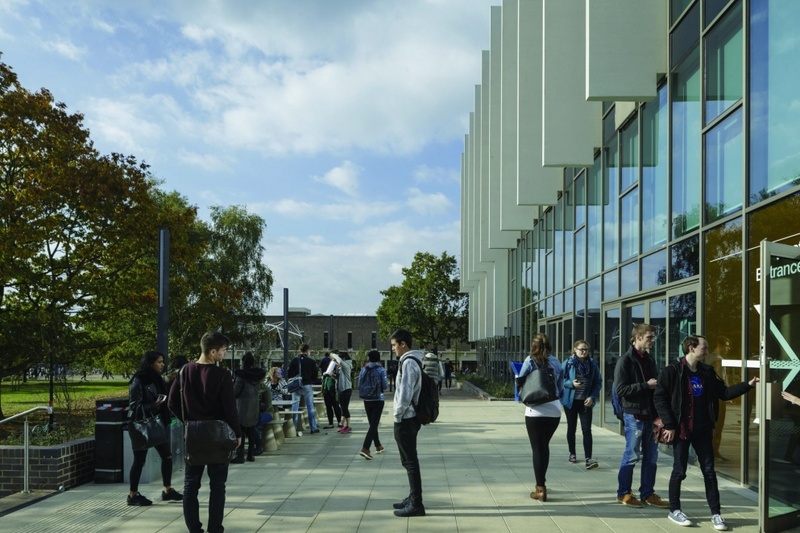 Firstly, Winstanley says, “They really needed more space.” The original building was designed for 6,000 students – a fraction of the 15,000 students currently using the hilltop campus. Penoyre & Prasad employed a range of approaches to stakeholder consultation to gauge how students used the library, and design spaces that supported a variety of study methods, including use of tablet devices, as well as being adaptable to future changes. “We could have extended upwards, at the front; or the back of the existing library,” says Winstanley. The decision to extend to the west, she explains, was influenced by both the original Holford masterplan that envisaged new wings east and west, crucially as a logical place to build whilst the library building was in active use throughout construction. glazed facade. The intention was to graphically invert the language of the original building. 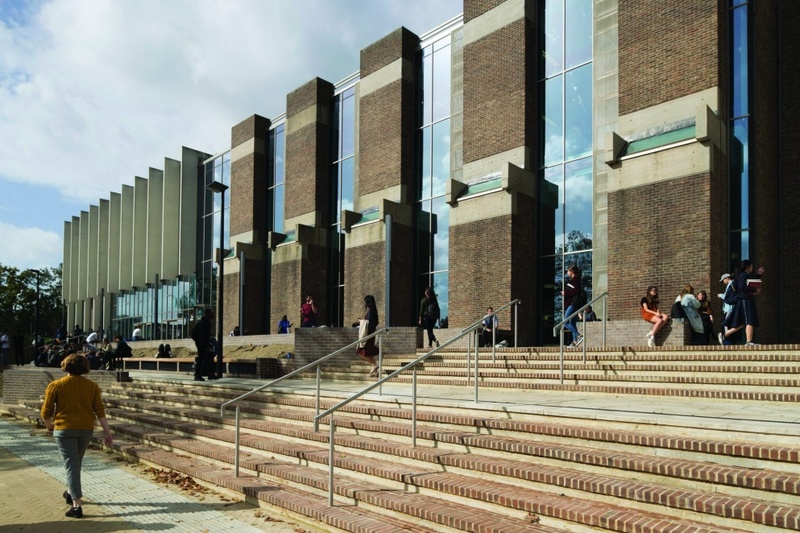 Winstanley explains: “The brutalist building has brick buttresses that widen at the ground. We referenced the form but inverted it and lifted it off the ground. The issues of unclear and un-level access were solved by providing a raised outdoor terrace, which signals the location of the main entrance. 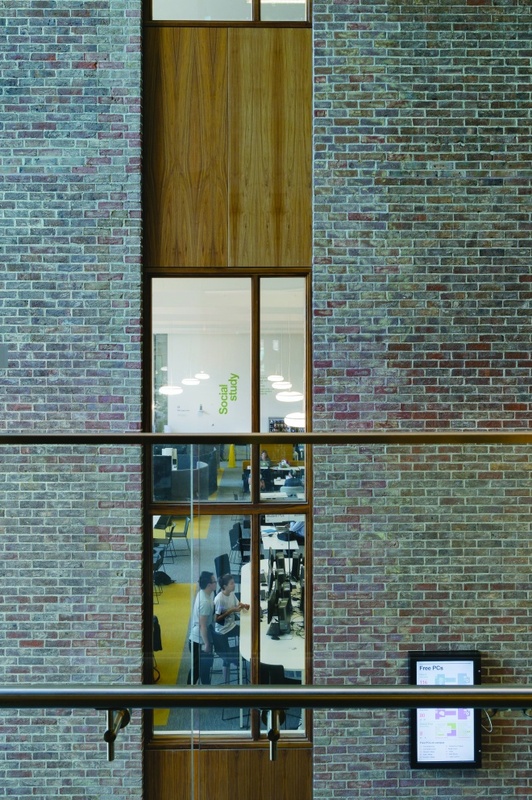 Frameless glazing complemented the facade, and the cutting back of floors from the envelope of the original 1960s core building provided more space for light to enter between levels. The old loading bay was also renovated to create a grand new entrance, and the north-south route through the new extension ensures the building doesn’t block the easy flow of movement around the campus. Wide strands of bronze anodised mesh run down the building’s facade between the concrete fins. Winstanley explains the specification choice here: “We wanted something that would work as an alternative to the timber , that would still feel right.” The warm tones of the bronze also counterpoint the more austere brick and concrete, balancing the aesthetic and giving it a contemporary edge. The particular shade of bronze used, which Winstanley says “worked well with the original building palette” matched the American walnut used for windows and interior furnishings. In addition to the extension, the renovation of the original building saw new curtain walling replace the glazing set between the brick piers. This serves to “weave the language of the new library extension into the existing building to create a cohesive whole,” says the project leader, as well as reducing the number of horizontal contours imposed by the former abundance of windowsills that could hinder the overall aesthetic. Given the extended periods that students were spending in the library, it had to be a comfortable space to study in. 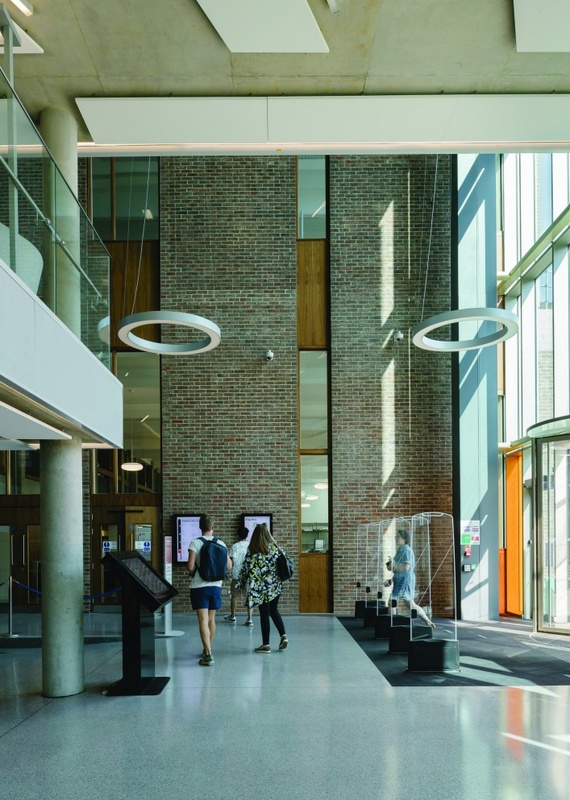 Double-height spaces are continued from Holford’s original 1960s design in the extension, giving ample natural light and space for students studying. The deep-plan character of much of the building meant that natural ventilation, on its own, wasn’t feasible. The solution was a mixed mode ventilation system achieved through the use of manually openable sash windows, which not only help students engage with control of their environmental comfort, they also provide better airflow than tilt-turn windows. 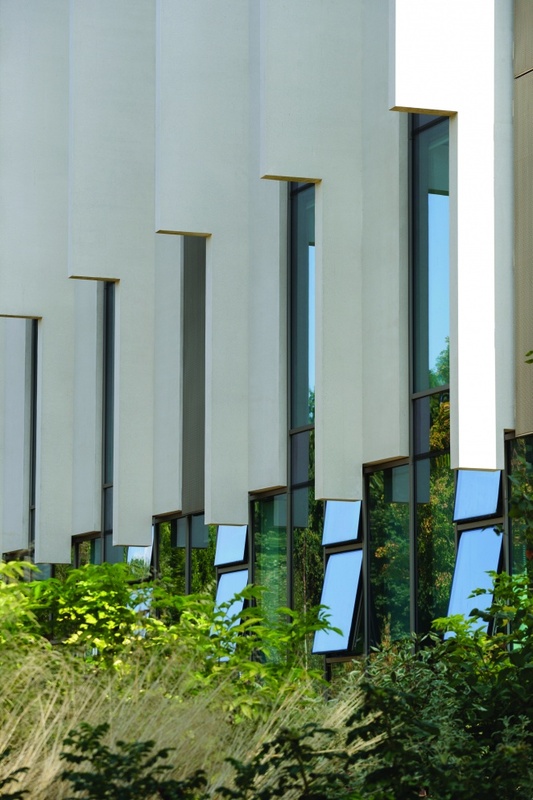 Out-of-reach windows are mechanically assisted by actuators which open the windows automatically when CO2 levels get too high, and there is additional mechanical ventilation. When it comes to library acoustics, Winstanley advocates a mix: “You want some areas to be really noisy, some areas to be kind of social, and some areas to be really, really quiet.” She adds that robust envelope design is key: “As a result of the envelope being acoustically good, you don’t get lots of noise from outside, and you don’t get lots of noise leaking from one floor to the other.” Acoustic soffit boards on the ceilings are shaped to reiterate the pattern introduced by the diagonal in situ concrete coffered soffit located at the top level of the building. 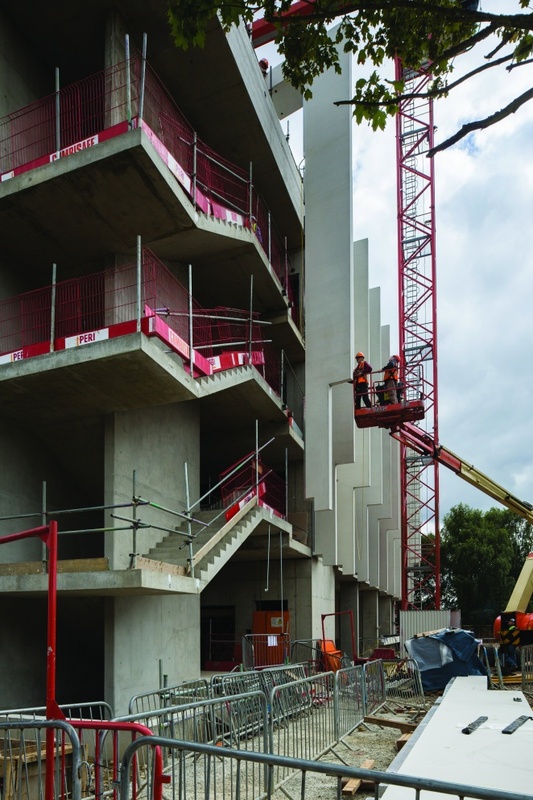 An adhered layer of insulation backing the precast concrete fins contribute to the building’s thermal performance, and mitigate the cold-bridging the existing building had suffered from. It is expected to be awarded a BREEAM Very Good rating. A series of measures were taken to appropriately illuminate the spaces in a way that gives a sense of comfort to the users: “We tried to provide a slightly more layered feeling with lighting, which is why we’ve got task lighting, freestanding lighting, and background as well as accent lighting.” Hand-operated blinds help give students a sense of ownership, says the architect, while higher automated blinds, plus the concrete fins and non-glare glass moderate harsh direct sunlight. The bronze anodised mesh veils double up as both a sunshade and a discrete security measure to prevent theft of books and media. The result is a coherent building internally and externally. A set of interior spaces are combined to clearly support students’ comfort and needs, through the meticulous control of aspects of air flow, light, heat, and sound and how they penetrate into and around the building. The architects’ emphasis on open space has been realised to the extent that where double-height spaces aren’t present, they are at least in sight. Viewed from the outside, four different eras of construction are knitted together almost seamlessly to produce a cohesive whole. The materials and form of the additions respect the building’s original brutalist intent while re-balancing it and bringing it into the present day.